I have a new toy in the shack: the Icom IC-7300. Last night, a good friend handed over his brand-spanking-new IC-7300 and is allowing me to evaluate it over the next week or so. The IC-7300 is Icom’s first “entry level” RF, Direct Sampling System HF transceiver. It’s a slick machine, indeed! Time permitting, I plan to post a few audio clips and get reader reactions much like I did for in the portable shoot-out. I’ll compare the IC-7300 to my Elecraft KX3 and a few SDRs as well. Of course, I’m evaluating this during one of the busiest times in my life, so we’ll see how quickly I progress–! Simply follow this tag for updates: IC-7300. This entry was posted in Ham Radio, New Products, News, Radios, Shortwave Radio and tagged IC-7300, Icom, Icom IC-7300 on April 15, 2016 by Thomas. Wow nice radio, you are lucky to have got your hands on one. Most people are waiting for the reviews to come out before taking the plunge. I have been meaning to get a decent basestation for some time. So if your reviews are favourable I might go for one. I have a IC-7000 at the moment, but with that they crammed too much behind the menus and had an even smaller screen. So if I could get a 7300 for the shack and throw the 7000 in the car for longer journeys it might serve me better. I’ll do my best to evaluate this girl! I can say that the interface is the best I’ve ever seen from Icom. Even better than their 7100. OR, as an idea…Send me the 7000, keep the 7300 on your desk and run it by remote through your phones internet connection. …how does this new receiver compare to the old workhorse types from yesteryear…(Collins, Hallicrafter,etc.)? That’s a tough comparison! 🙂 Some of that classic gear has a personality of its own and characteristics some of us love over any late model stuff. No doubt, this Icom would spec out as a better receiver than the workhorses of yesteryear. It’s certainly _way_ more versatile. When I need sheer performance, then I turn to my modern stuff–SDRs and hybrid tabletops–when I want to play, I warm up the tube gear. It would be great if Icom made a receive-only version of this transceiver. It would likely be too expensive. The market for an SDR SWL receiver is much smaller than the market for an HF transceiver (I assume), and while removing the power amplifier, antenna tuner, microphone and other components would lower the cost of the radio, the effort to recoup the engineering investment and custom tooling would probably be cost-prohibitive. I don’t agree that it would be expensive at all. If Alinco can release a DX-R8T based on a ham transceiver than Icom can do something similar. Despite what manufacturers and some people believe, not everyone is interested in SDR that is dependent on a PC desktop/laptop/tablet. That route just takes away from the real fun and learning experience of using a hardware based receiver with knobs and buttons. The difference between the two models (transceiver v receiver-only) is about 15%, so your point stands, bit about half that discount comes from not including a hand mic in the box. A receive-only IC-7300 (R-7300) that cost 15% less than a transceive-only version would be a different animal inside (circuit board reuse would be minimal) and as such would require separate FCC certification, require it’s own R&D budgets hat would approach that of the transceive version of the radio, and require different spare/replacement parts be stocked. Or you could just buy the transceiver version, keep the mic in the box, and get top dollar on the resale market. Good points, Ken. Like you, I seriously doubt Icom would go to the effort of making an RX-only version. The market would be pretty small for recouping any R&D/testing costs. Since I have the IC-7300 set up to test/compare the receiver, it’s using an amplified splitter that can’t be used for transmitting. I have the output power set to 0 and it feels just like a tabletop RX! The SWL version of IC-7300 (the R-8600, presented at Tokyo in 20aug2016) is not only remove the power AMP, antenna tunner and hand mic from the IC 7300. It also adds coverage from 70Mhz up to 3GHz, range that the IC-7300 misses. It also allowds to listen D-STAR, P25, NXDN and dPMR, wich yhe IC-7300 doesn’t. ICOM just launched at Tokyo ham fair the Icom R-8600, wich is the SWL version of the IC-7300. The R-8600 covers from 0.1 to 3 GHz, it is NOT just a function-removed IC-7300 transceiver. Please try it on medium wave as well. That is an intriguing rig – love the spectrum display and I’d like to hear how useful it is while scanning the bands. You can view 500 KHz at one time, that is great for browsing SW bands. You can even view a full 1 MHz (+/- 500 kHz) at a time. It can get a tad crowded on the tiny screen, though. 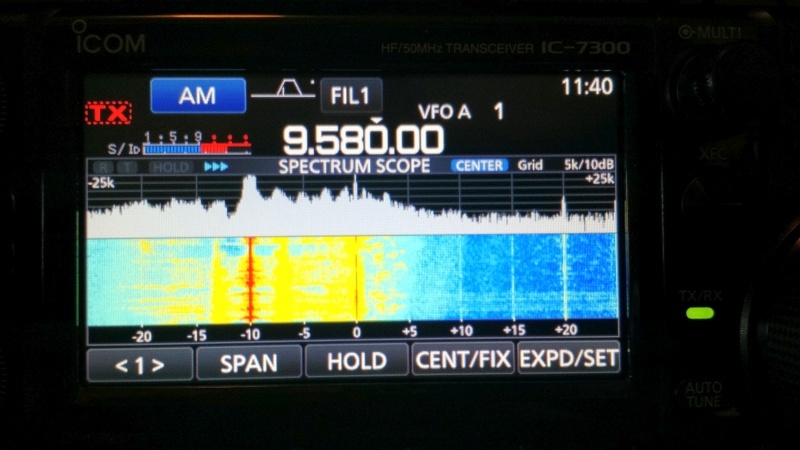 You are, of course correct – the IC-7300 can display a 1 MHz slice of spectrum. So far I can say that it is quite useful. Great detail and it’s easy to change the span of the display (narrow/wide). It would be very useful under DX conditions where you’re trying to follow where your target is listening in split. Absolutely–it is completely stand-alone and requires no Internet connection other than to do upgrades. In fact, I think it might be an excellent Field Day or GOTA rig! I would not want a rig tethered to the internet, I look at SWL as a replacement to the internet. Plus the airwaves are free the internet requires a toll booth (or portal) to connect to. I don’t get why short wave broadcasters are leaving and going to internet “radio”. Internet only needed to download firmware updates to SD card, the update is performed off the SD card alone. One very real benefit of Internet-based ‘broadcasting’ is you can prove people are listening, SW broadcasting over the air is an act of faith. Lucky you – what a fun toy to have, even if temporarily! Although I have no need for one I will be interested in how it performs on receiving signals in close proximity to other strong signals. I’ve recently made the move to SDR and will be comparing me Flex to the K3 on my own blog soon. Hi, John! I look forward to seeing your comparison! I’ve tinkered with the idea of reviewing a Flex (even getting one of my own) but haven’t done so yet. Reports are quite positive. I have no less than three friends that have the new Maestro touch screen front panel on order. (I have friends in the right places). Icom continuously refers to the IC-7300 as “entry level.” I doubt it’ll compare with the likes of the Flex 6000 series. BUT … being a ham rig, how does it deal with SWLing? What is the widest filter? Can you isolate a DRM signal with it? How well does it work thru the USB socket? Had mine two weeks, it’d arrival prompted me to put up a better antenna at my HOA-afflicted QTH, and I love it. There is a firmware update, I’d suggest installing it with your friend’s permission – it contains a fix I filed with Icom when my radio arrived – the ‘Quick Menu’ screen had a typo, it said ‘Quick Memu’. Icom turned that ‘issue’ around in two weeks! My 30 year-old ‘new to me’ vertical was too out of resonance for the built-in tuner, but an LDG IT-100 fixed that toot-sweet! Take some time to read the manual(s) – there are a tremendous number of little things that are great, but not intuitive – for example, if you touch the clock in the upper-right corner of the display you get a full-screen pop-up showing local and UTC time. Sweet looking machine! I do miss the direct frequency entry – does the mike have that capability or does it rely on tuning/memories alone? I image it maintains last 3 frequencies per band like the older ICOMs. Looking forward to your review! It does have a direct entry keypad that’s available through the touch screen. Took me a minute to find it, but it’s pretty effective and easy to use. I’m not sure what the mic looks like, my buddy forgot to bring it last night! I’ll get it soon enough, though. Mic is a new model, it has up/down buttons on top, nothing else.